One thing that can interfere with this amazingly fine and fast positioning is vibration. Vibration can cause small variations in the position of the head with respect to the track, so it can be an enemy of the proper functioning of HDD's. But the mechanics of HDD vibration is an obscure subject, and as a result, there is an aura of mystery surrounding vibration. As part of my job, I've spent a lot of time and effort to understand vibration and to engineer our systems to deal with it. I'm hoping to share some of that with you to help demystify the subject. A WD Purple 8TB HDD has approximately 248 million tracks cut up into just north of 15 billion sectors across all platters. Let’s assume there are 8 platters in there and all are double-sided. That means there are ~15.5 million tracks on each surface of a platter. Assuming 3.5” outer diameter and 1.75” inside diameter, the actual usable space of the platter has a radius of 0.875”. That leaves us with 17.7 Million tracks per inch. Considering the thickness of a piece of standard letter paper is 0.004” that means you could fit 70,800 tracks on the edge of a piece of paper. That really is some tiny dimensions we're working with here. I'm going to ignore vibration from sources outside the computer since it's more an issue for laptops and desktops, I work with servers which are mounted in racks and generally not subject to external vibration. 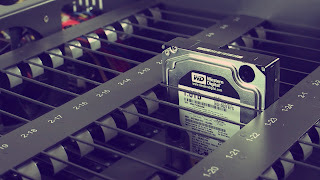 That leaves us with two main two main sources of internal vibrations: fans, and the HDD's themselves. Fan Vibration - Fans are a source of vibration but good quality balanced fans have less vibration and a large heavy solidly built server, such as our 45 Drives' Storinator, will reduce fan vibration. If the manufacturer pays attention, fan vibration can be well under the threshold that HDD's can handle. Now, let's talk about vibration caused by the HDD's themselves. 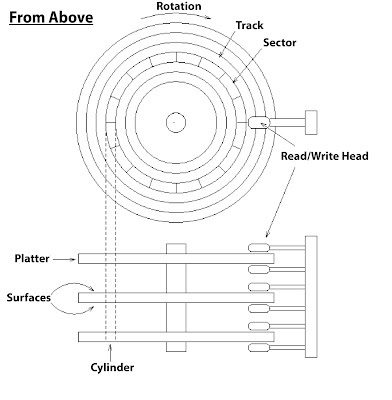 It comes two sources: platter wobble, and reaction to head seek acceleration. Platter wobble - Caused by a slight imbalance in the rotating platters. 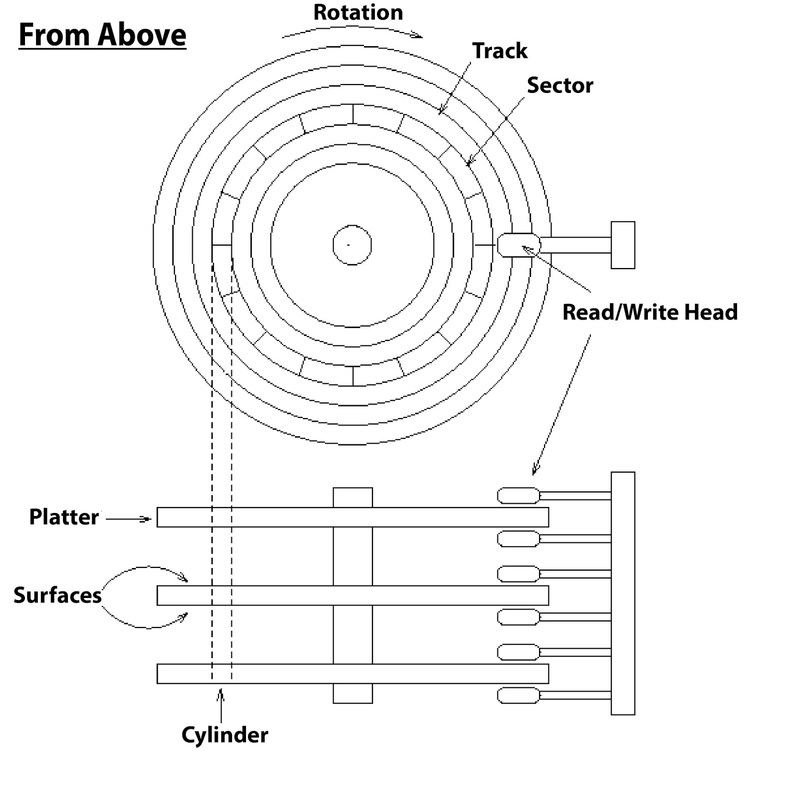 It is a readily identifiable sinusoidal vibration at a frequency that exactly corresponds to the rotational speed of the platter (90 Hz for 5400 RPM, 120 Hz for 7200 RPM, etc.). The dominant imbalance is in-plane so vibration is in the X-Y plane (see diagram below). The theoretical explanations are just fine, but it is much more interesting to actually see it. So we bought an accelerometer chip, wired its 3 axis outputs through op-amps. These were fed into a storage scope so we could record waveforms. 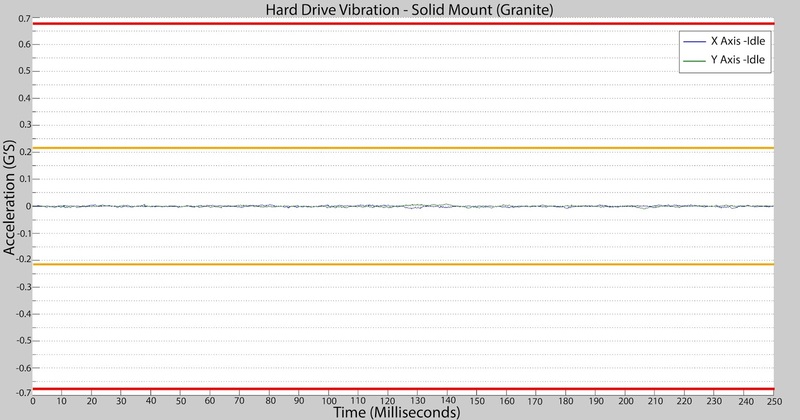 Then I attached the acceleration to a Western Digital Ae 6TB HDD which I picked because I happened to have it on hand, and happens to have typical vibration characteristics. I then recorded HDD vibration under two conditions: free floating (actually suspended on elastics); and attached to a massive block of granite. These show the maximum and minimum magnitudes of internal HDD vibration (free-floating shows worst case, HDD mounted to granite shows the best case, whereas HDD's mounted in a real server are an intermediate case). The next two graphs were captured while the HDD was free floating. This represented the worse case drive mounting scenario. The Y Axis is the acceleration in G's (1G =9.8m/s^2), and the x-axis is time. Soft Limit - The yellow lines are a soft limit around ~0.22 Grms where performance degradation will start to become annoying (exceeding %10). The vibration level causes position error that is great enough to cause an IO miss but not big enough to cause a full on timeout between the disk and the disk controller. Hard Limit - The red lines are a hard limit at ~0.67Grms, where the HDD will experience non-recoverable errors and the HDD will not operate in a useful fashion at all. The next graph is the same setup, but displaying Y-Axis data (recorded at a separate time). The blue trace is under idle conditions and the green trace is a during a random write. Again, yellow is the soft limit, red the hard limit. I haven't shown the Z-axis because vibration is minimal. If we rigidly couple the HDD to anything massive, vibration is dramatically reduced. Therefore a single HDD mounted to a chassis with no other sources of vibration will perform well,without any vibration problems. Unfortunately, in the real world, a server typically has multiple disks, a large PSU with fans, and multiple cases and CPU fans. These all create a vibration which superimposes. Thus one must carefully design the chassis such that HDD's are coupled to it with sufficient rigidity; and that the chassis itself has sufficient mass and rigidity in order to suppress vibration. All this must be measured carefully. I'll be writing another blog entry showing what this all looks like.